When we looked around for an affordable speaker that matched the standards of audio accuracy and quality in Spirit's consoles, we found there was no such thing - so we built it ourselves. The result is Absolute2, the only loudspeaker in its price range to deliver this much power with this much precision - a thumping 100W of professional sound. Whatever the size of your studio, whether you're mixing music or dubbing sound for picture, the basic requirements for an effective nearfield monitoring system are the same: an uncoloured, flat frequency response, minimal distortion, and an ability to deliver high volume when you need it. Absolute 2 offers all this, at a price that no other professional monitoring system can touch - because we know from our experience with mixers that good designand high quality construction don't have to cost more. 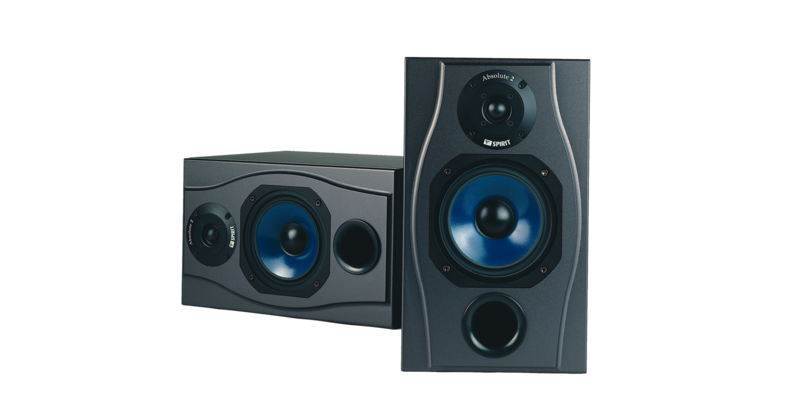 The advanced vented cabinet design complements the 6.5"/165mm low-frequency driver to give smooth, extended bass response. The soft-dome tweeter and high quality crossover keep the frequency response smooth right up to a crisp high end that's free of unnatural colouration - unlike the harsh sound of some other low-cost monitors. Of course, it would be a shame if you could only appreciate Absolute quality in the studio, so we've included magnetic compensation to ensure that Absolute 2 is safe for use next to video and computer screens, and terminals for bi-wiring mean that you can also use Absolute 2 as a superior hi-fi speaker. As with Spirit mixers, the electronic design of Absolute 2 uses high quality components, including film capacitors and an air-cored inductor,in a circuit that embodies classically simple design principles. Terminals allow bi-wired as well as standard connections. Rather than compromise with off-the-shelf components, we use custom hardware built to our specifications - both drivers are exclusive to Absolute2. The LF driver features a solid-cast chassis and 30mm edge-wound voice coil, for optimum efficiency and cooling. That means you can push Absolute 2 to the limits and still hear music, not distortion. The vented cabinet employs a special port design that does more than simply deliver extended bass response. With its carefully chosen dimensions, air turbulence is reduced, contributing to Absolute 2's smooth, uncoloured low frequency characteristics. Absolute 2's are designed to work best in the upright position, but they can be used horizontally if preferred. Bass response is best when the cabinets are close to a back wall. Amplifier power ratings of up to 100 Watts RMS can be used, though more powerful amplifiers can be used with caution. Connection to Absolute 2 is by high quality terminal which will accept bare wires, 4mm 'bannana' plugs or 6mm fork terminals. Bi-wiring of the HF and LF connections can be made by removing the shorting links supplied and using two sets of cables from the amplifier. This will improve sound quality slightly by reducing the interaction between the drivers in the region of the crossover frequency. E&OE. Soundcraft reserves the right to alter designs or specifications without prior notice.